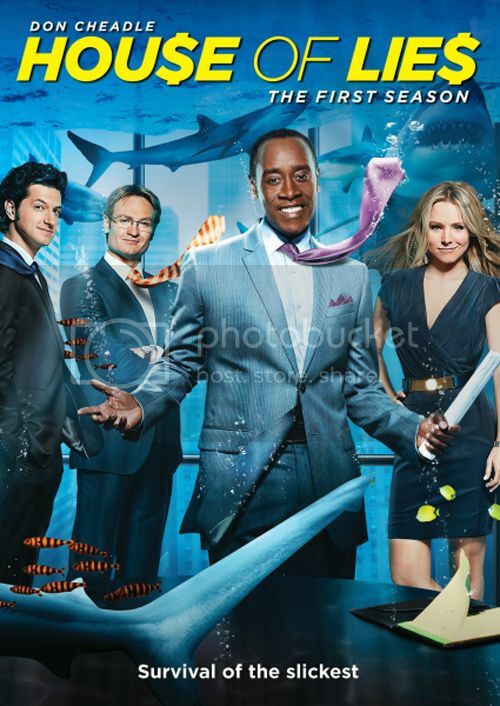 Buy, Rent or Skip House Of Lies (Season 1)? I knew that Kristen Bell had a new series, but not having Showtime, this really wasn't something that I actively went out to learn about. As a matter of fact, I went into House of Lies completely in the dark. I didn't even know what the series was about or the idea that it would be based in the 'Consulting' world. I'm glad I finally got to check this one out. It was really good and now I have something to look forward to. Yay! Now, lets get back to Kristen for a second. Boy, did my girl ever blow up her 'squeeky clean' image from Veronica Mars. Up till now, I had never heard her utter any profanity. Potty mouth.....and I love her even more. Overall, this is a great series and I'm glad that Don Cheadle is getting some face time of his own. I hope he rides this series for as long as he wants or for as long as the writing stays sharp. I like the fact that his character often breaks the 4th wall to address something at hand with the audience. It has always been a unique plot vice and rarely is it ever used anymore. Really cool to see Ben Schwartz on the show. I often wondered why he suddenly disappeared off of Parks and Recreation. Now I know. I highly recommend this as a Rent. Very entertaining and very good. I'll have to check it out, I admit I don't know anything about it either. Though the direct-to-camera address is also used in House of Cards, which I accidentally misread the title as when I clicked on the link and Spacey freakin' owns it. 12 episodes. Pretty much all cable shows fall into the 12-13 episode range. The only downside to this one as well as Califorinication is that they are only 30 minutes per episode. Sigh. I was expecting it to be an hour-long drama. So, this blew by extremely fast. I tried to pace myself and make the show last longer. But when a show is good, it's hard to contain oneself. Thirty minute long cable shows... I have a hard time wrapping my head around that. But maybe that's what got them the 12 instead of 10. Cable shows are sort of Britain-izing us with those season lengths. Don't even get me started on the 6 episode "seasons". Ya need encouragement to give the show a try? I looooooooove you Kristen! BTW, six episode series that rock: Fortysomething (6 all together), Black Books, IT Crowd... and Life on Mars UK only had 16 episodes TOTAL and it was one of the best TV shows I'd ever seen. House of Lies is one of my fav shows I try not to miss. The first season just shoots out like a bullet. The half hour show is over in 2 minutes… No seriously. This is such a well written show. All the characters are just off the charts. This is one program you don’t blink. The pacing is electric fast. The 3rd wall was very cool the first few episodes, especially how they freeze the room and then walk around it. That pretty much goes away in following episodes. I can’t recommend House of Lies enough. Cheadle, Bell and company are a blast to watch. It is very adult in nature. Content, visuals, subjects, etc. Not for the kiddies or puritan prudes.